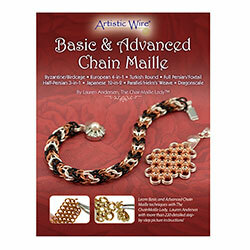 Now both Basic and Advanced Chain Maille Booklets are combined into one! Author and Chain Maille expert Lauren Anderson guides you through four basic patterns using 18 gauge rings to explain the essential techniques and weave patterns that are the basis of chain maille: Bysantine/Birdcage, European 4-in-1, Turkish Round, and Full Persian/Foxtail. After you've mastered these four basics, Lauren then guides you through four advanced techniques: Half Persian, Japanese 12-in-2, Parallel/Helm's Weave, and Dragonscale, to weave like the experts! 7 in wide x 9 in tall, 62 pages.